This entry was posted in Islam, Jesus, Middle-East and tagged Canon White, Iraq, Persecution by Richard Barker. Bookmark the permalink. Thankyou for posting about this. 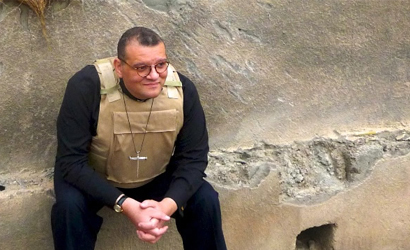 Two weeks ago, I heard Canon Andrew White on Tru News speak on Iraq and his missing congregation. He was in tears. I hadn’t been aware of the Christian’s plight in Syria and Iraq until then. I had an opportunity to hear from these persecuted Christians myself on Sunday (31/8/14). Some church elders and translators from the Assyrian Church came to speak to our local churches about the situation. I was glad to see a lot of Christians from our community come to lend their support. The priest who spoke was Father Fadi and he was from St Matthews Monestery in Mosul. They speak Aramaic, the language of Jesus, I had never seen a member of the persecuted church before. His family are still in Iraq. I am going to blog about it on the weekend. The situation is dire and they need our prayers. As for other support, Canon Andrew White has set up a fund for the Church in Iraq. Thank you Jo. You may like to know I had an email this morning about his urgent return to the UK which I will send direct for your info.